Silver Spring, MD, May 11, 2017 – After a record 2016, Acorn TV is thrilled to announce more exclusive first-rate international mysteries, dramas and comedies throughout 2017. Called “Well-written, beautifully acted and surprisingly compelling scripted television… an essential must-have… along with HBO Go and Netflix (The Hollywood Reporter) and “A perfect streaming service for the Anglophile in your life” (The New York Times), Acorn TV continues to curate the very best in international television and has become the premier North American streaming service for world-class TV from Britain and beyond from RLJ Entertainment (NASDAQ: RLJE). Following the exclusive premieres of critically acclaimed Acorn TV Originals Agatha Christie’s The Witness for the Prosecution with BBC One, Agatha Raisin with Sky, The Level with ITV, and Close to the Enemy with BBC Two, Acorn TV has more than 14 exclusive U.S. Premieres coming up in 2017. Acorn TV Originals include ITV’s atmospheric thriller Loch Ness, the final episodes of hit BBC One detective drama George Gently, new Kay Mellor BBC One drama Love, Lies and Records, and Irish thriller Acceptable Risk. 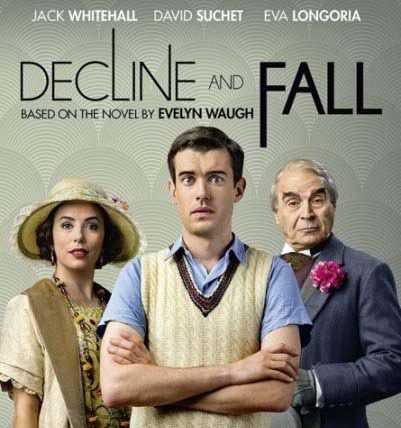 Hit new series include the first-ever TV adaptation of Evelyn Waugh’s classic comedy Decline and Fall from BBC One, British drama Delicious, ITV medical drama Good Karma Hospital, and Aussie medical dramedy The Heart Guy. Additionally, 2017 features exclusive new seasons of several of Acorn TV’s trademark series, including addictive Aussie period drama A Place to Call Home, Season 5; smash hit ITV detective drama Vera, Series 7; “Acorn’s superior legal drama” (TV Guide) Janet King, Series 3; #1 Australian drama 800 Words, Season 2; award-winning Canadian cop drama 19-2, Season 4; and Acorn’s most popular series, Doc Martin, Series 8, starring Martin Clunes. Acorn TV’s international distribution partners include Endemol Shine International for Good Karma Hospital, A Place to Call Home, Delicious and Decline and Fall; ITV Studios Global Entertainment for Loch Ness and Vera, Content Media Corporation for 19-2, Soho Moon for Acceptable Risk, DRG for Doc Martin, FremantleMedia International for The Heart Guy, DCD Rights for Janet King, All3Media International and Rollem Productions for Love, Lies and Records, and All3Media International for 800 Words and George Gently. The UK-based development division for RLJ Entertainment’s Acorn brand, Acorn Media Enterprises, is the U.S. co-production partner for Acceptable Risk, George Gently, Series 8, and Love, Lies and Records. Called “One of the best legal procedurals I’ve seen in years” (Slate) and “Acorn’s superior legal drama” (TV Guide), Janet King stars Marta Dusseldorp (A Place to Call Home, Jack Irish) as a brilliant lawyer in eight new episodes. Full of twists and turns, the series offers an “astutely realized mystery” (The Australian). The final season of the Canadian Screen Award-winning drama and International Emmy-nominated cop drama . Called “One of the best cop dramas ever” (Tribune News Service) and “Makes the genre seem new again…exciting in a wholly new way.” (The Wall Street Journal), this intense, character-driven drama stars Canadian Screen Award winning actors Adrian Holmes (Arrow, Smallville) and Jared Keeso (Falling Skies) as partners in the Montreal Police Department. This seductive medical drama is set in a coastal town in tropical South India and tells the story of junior doctor Ruby Walker (Amrita Acharia, Game of Thrones), who arrives in India looking for a job and a distraction from her heartbreak. She anticipates the sunshine, the palm trees and picture-perfect beaches. She’s even prepared for the sacred cows, the tuk-tuks and the Delhi-belly that everyone warned her about. What she doesn’t expect are the realities of work, life and even love at an under-resourced and over-worked cottage hospital. The series co-stars Amanda Redman (New Tricks) and Neil Morrissey (Striking Out, The Night Manager). A gripping international conspiracy thriller starring award-winning actress Elaine Cassidy (The Paradise, No Offence) and set in the high stakes world of big pharmaceutical. When an Irish marketing executive for a pharmaceutical company is murdered while on a business trip to Berlin, his wife begins to believe that the firm is covering up details about his killing. As she does so, she becomes aware that both her dead husband and herself were the object of an intense surveillance operation that has been tracking their every move. Overnight, her secure, comfortable, upper-middle-class lifestyle has been shattered. One of Acorn TV’s and ITV’s most popular series returns. BAFTA winner Martin Clunes (Arthur & George, Men Behaving Badly) offers an uproarious lead performance as a tactless, self-centered, and uptight doctor in a quirky seaside town in Cornwall. After having therapy to save their marriage in the last series, Doc Martin and Louisa face the challenge of living happily together with their baby, James Henry. Set in the fictional town of Portwenn, the series also features Caroline Catz (Murder in Suburbia) as his wife Louisa and Dame Eileen Atkins (Upstairs, Downstairs, Cranford) as the Doc’s formidable Aunt Ruth. The final two feature-length episodes of the EDGAR®-winning BBC One detective series. Called “Great, bordering on brilliant” (Esquire) and an “excellent BBC detective series” (Los Angeles Times), Tony® nominee Martin Shaw returns for his final cases as North of England’s most upstanding detective, George Gently, again assisted by his trusted partner, Detective Inspector John Bacchus (Lee Ingleby), and Detective Sergeant Rachel Coles (Lisa McGrillis). Richard Harrington (Poldark, Hinterland) guest stars. Called an “instantly irresistible saga…captivatingly filmed, deeply romantic drama of immense intelligence distinguished by a uniformly superb cast” by The Wall Street Journal, Acorn TV’s addictive Aussie period drama returns starring Marta Dusseldorp (A Place to Call Home, Jack Irish) and Noni Hazlehurst (Little Fish). Against the backdrop of post-World War II Australia, A Place to Call Home follows Sarah Adams, a nurse who becomes involved in the affairs of the wealthy Bligh family. Dealing with themes such as anti-Semitism, sexuality, and social class, this rich and meaningful, high-quality production has been hailed as one of the best television series of 2015 by The Wall Street Journal. Called “One of the best mysteries…in the last decade” (The Baltimore Sun), Vera follows a cantankerous but brilliant detective who solves unthinkable crimes in northeast England. Two-time Oscar® nominee Brenda Blethyn imbues DCI Vera Stanhope with “a monumental intelligence” (The Guardian) in this hit detective drama inspired by Ann Cleeves’ bestselling crime fiction. WATCH: Acorn TV’s exclusive May/June premieres can be watched now at press watch site, https://acorn.tv/press (mirror to your TV via Apple TV or Chromecast) with DVDs available upon request.